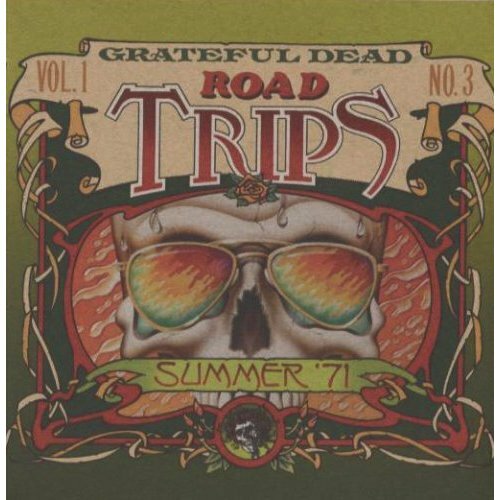 With the 20/20 hindsight that history provides, it's easy to look at the spring and summer of 1971 as a transitional period for the Grateful Dead. After all, we know that Mickey Hart's extended hiatus began during the group's run at the Capitol Theatre in Port Chester, NY, in February 1971, leaving the band a quintet for the first time since the fall of 1967. And we also know that a mere eight months later, in October '71, Keith Godchaux was out on the road with the Dead as their first-ever pianist, marking a fairly radical shift in the group's sound. But in between those two milestones were a lot of really good shows that don't sound at all like a band on its way to someplace; rather, like a unit that has arrived at some particularly exciting and scenic destination. For what the seven months between the Capitol run and the quintet's finale at Gaelic Park in the Bronx in late August showed was the original core group's incredible dexterity as a unit, and their renewed sensitivity to nuance. Garcia famously described that lineup as a "shoot-'em-up saloon band," but that is selling the group short. Yes, flights into rockified country were inspired and remarkably authentic, but their shows offered so much more: jams that felt stripped to their pure essence, floating and crashing and soaring and swinging on the dependably weird and meandering rhythmic river of Phil's anaconda bass and the quicksilver beat of Bill Kreutzmann's drums; and plenty of good-time rock 'n' roll, blues and R&B, as well. As the year started, the Dead were more popular than they had ever been before. They had to bona fide hit albums come out in 1970--Workingman's Dead in the spring, American Beauty in the fall--and FM radio had embraced a handful of songs from each record, all still regarded as classics in the Dead canon. For better or worse, the Grateful Dead had collided with the mainstream! The first half of 1971 saw the introduction of nearly as many new Dead songs and cover tunes as they'd broken out during the preceding year; it was truly an unprecedented outpouring of creativity. Rather than going into the studio and churning out yet another album, however, the band chose to hone their new material on the road. Actually, there was some studio action that summer: Garcia and Kreutzmann convened at Wally Heider's studio in San Francisco in early July to record Garcia's eponymous solo debut, which featured a slew of fresh nuggets, most of which were either recent additional to the Dead's repertoire or would be shortly after being recorded. The Dead's reputation for marathon good-time shows definitely preceded them--particularly on the East Coast--and it wasn't long before demand for tickets spiraled to unprecedented levels. Suddenly the Dead had no problem selling out six nights at the Capitol (one of those shows, 2/19/71, was released as Three From the Vault in 2007) or five nights at the Fillmore East in New York (a series of shows beautifully documented on Ladies and Gentlemen… The Grateful Dead). College gymnasiums and small sports stadiums were packed with a new breed of rabid fan who had suddenly acquired a name: Dead Heads. So it became incumbent on the Dead to find new, larger places to play. Which brings us to the Yale Bowl in New Haven Connecticut, on the last day of July, 1971. By that time, I'd seen the band a dozen times in the New York area--at the Capitol, Fillmore East and Manhattan Center; all cool venues. But when it was announced that the Dead were playing the Yale Bowl, I didn't know what to think. I had been there once to the see the first Giants-Jets football game (sad to say, I chose that event over going to Woodstock; who knew?) and couldn't imagine 70,000 rock fans packed in there grooving with the Dead. So I was pleasantly surprised when I arrived that hot summer afternoon and found that only one end zone of the stadium was being used for the concert. Even so, it was the most people I'd ever seen at a Dead show. In those days, the beginning of a new tour usually meant the unveiling of new songs, and at the Yale Bowl we were treated to a pair of newly minted tunes: "Mr. Charlie" was a funky, chugging Pigpen/Robert Hunter song (what the hell is "alligator wine," anyway! ), and "Sugaree" had come out of the Garciasessions earlier that month; it was an instant favorite, even at the dawn of its long evolution. (The version of "Sugaree" that appears on Disc 2 is from three weeks and half a dozen playings later.) Looking back at the set list for the Yale Bowl show, I'm struck by how much the show was dominated by songs that the band had been playing for less than two years. This was clearly not a band resting on past glories, and the oldest original song they played that day, a vast and sprawling "Dark Star," was far from a '60s throwback; rather it was wholly representational of the spacey side of the '71 Dead. Unfortunately, the "Dark Star" on the recently rediscovered master soundboard recording of the Yale Bowl show is missing a couple of minutes from the early part of the jam (no doubt a victim of a tardy reel change), but it still stands as a magnificent piece of music, certainly among the best versions of the song from that year. We've elected to patch the "Dark Star" with an audience-recorded version of the missing section--certainly not perfect, but at least it's complete and captures the song's full flow. Actually, one of my strongest memories of the Yale Bowl show is non-musical: It is the sight of tear gas rising above the rim of the stadium during the killer double-encore of "Uncle John's Band" (which, since Workingman's Dead, had pretty much become every Dead Head's favorite song) and "Johnny B. Goode." Some local radicals had tried to crash the gates, believing that the Dead were a "people's band" and the concert should have been free, but they were repelled by a gaggle of tough New Haven cops decked out in full riot gear--maybe some of the same bunch that had maced and arrested Jim Morrison at the New Haven Coliseum three years earlier! My eyes were stinging by the time I made it back to my car, but on the long drive home, the pain was replaced by happy memories of a spectacular show. Now, I did not attend the other show represented on this Road Trips set--from the Auditorium Theatre in Chicago, August 23, 1971--but I did see the Dead twice at that venue in October '71, during my freshman year at Northwestern, so I can report first-hand about what an amazing place it was to see the Dead (or anyone else for that matter: I saw epic shows by Pink Floyd, Mahavishnu Orchestra and others there). The Auditorium Theatre was designed by the renowned Chicago architect Louis Sullivan and completed in 1889. Sullivan was noted for incorporating broad, graceful arches in many of his designs, and the Auditorium is a magnificent example of this: The ceiling over the orchestra is split into bands of golden-lit arches that lead gently down toward the proscenium stage, to stunning effect. The arches are exquisitely detailed with intricate Romanesque architectural/sculptural flourishes, and beautiful pastoral paintings grace various walls and walkways. Sightlines in the 4,000-capacity theater are wonderful; the natural acoustics almost perfect. In other words, it's much too nice a place for rock 'n' roll! Yet that's how the venue made most of its money during the late '60s and early '70s, after being used primarily for opera and classical music during the first seven decades of its history. The Doors played there, as did Hendrix, Elton John, the Beach Boys and scores of other top bands. But frankly, the cost of keeping this landmark in mint condition was that security there was, shall we say, a bit restrictive. I remember the white-gloved and ultra-uptight Andy Frain ushers--looking like bellhops from some '40s movie--ruling the place with an iron fist, forcing people to sit down rather than dance, shining flashlights in people's faces if they dared move one foot out into an aisle. Worse, at the October '71 Dead shows, management left the house lights on for the entirety of both shows, the only time I saw that happen there. Perhaps there had been some...er...misbehavior at the two August Dead shows; who knows? Whatever the hardships, it was still a great place to experience a show, and the Dead definitely seemed to rise to the occasion whenever they played there (the '76 shows were excellent, as well). Among the highlights here are a truly transporting "That's It For the Other One" split by "Me and My Uncle" (love that juxtaposition!) clocking in at some 35 minutes total--wow! The night after the second August '71 show at the Auditorium the Dead were scheduled to play at Gaelic Park, but a steady downpour forced the show to be cancelled, so the sold-out crowd of about 10,000 had to come back the next night and stand in the dirt and mud to enjoy their heroes. Oh, well, at least the ushers were nice, and the band, as usual, played well. It would be Pigpen's final show until December of that year. This album was released in June 2008.